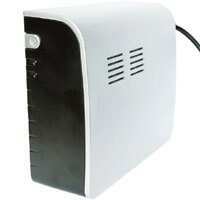 Save and shut down: For most PCs, a UPS rated at 600 VA will suffice. The importance of protecting your desktop computer can never be emphasized enough. Irrespective of how much you spend on your components, danger lurks in the wires that supply electricity to your home and PC. A UPS (uninterruptible power supply) is a device that provides uninterrupted and regulated power to sensitive devices such as computers. It will allow your PC to run for a few extra minutes after a power cut, allowing you to save your work and shut the computer down properly. If the power supply to your PC suddenly gets cut, several things can happen—such as possible damage to your hard drive and RAM (usually in that order), and putting your motherboard at risk. A UPS eliminates that risk. Stand by: This type of UPS simply switches the load to the battery—in case of power on the AC power line. The response time of the switchover (called switching time) is 2-10 minutes. Since most SMPSs (switching-mode power supply) have a hold-up time of no less than 16 minutes, i.e., greater than the switching time of the UPS, there is no problem of shutdown between the transition from mains power to the DC-to-AC inverter on the UPS. The most prevalent type of UPS today is the “line interactive UPS". These can regulate the input AC power to some extent and the battery is charged by AC power. When the AC power cuts, AC input is disconnected and the battery provides power. Such UPSs are also compact and this is what you will find with most vendors. These provide adequate protection from surges and spikes and, of course, blackouts. These are costlier. In this design, the AC mains charges only the battery via the inverter, and therefore, the output runs off only the battery. Since the AC line is never directly powering the connected equipment, there is no chance of damage through faults in the line. Also, there is no switching time involved. Most people will sell you a UPS on the basis of its backup time—this is wrong as the battery backup depends totally on the amount of power your system draws. The more powerful the system, the quicker the battery will drain. Backup time should be used wisely to save and shut down all running programmes and your PC, not to continue your work and hope the battery lasts. For most PCs, a UPS rated at 600 VA will suffice. If you are running a powerful PC with a quad-core CPU and a fast graphics card, you may want to look at something a little higher—800 VA should be good enough. When it comes to UPSs, be choosy about brands. APC, Numeric, Powersafe, Datex, Microtek and Powercom are some reputed brands. For most systems, APC Back-UPS ES 650VA (Rs3,100) should suffice. If you want a beefier system, try the Numeric Digital 800 VA (Rs3,200). This model is a little older but offers stability. Alternatively, you could go for the APC BR800-IN (Rs4,700). The APC Back-UPS RS 1500VA (Rs8,900) can support up to two PCs. Unfortunately, it only has three 6-ampere output for the battery backup, which means you will need to invest in a power strip (spike guard).